It seemed for a while that the relevance of the pop culture phenomenon surrounding teenage dystopian novels transposed to the screen had lost its luster. I guess not. The Death Cure is here to prove the genre is still alive and well. Whether that's a good thing or a bad thing, The Movie Sleuth is not quite sure. With the final Divergent movie getting the ax due to lack of interest and The Hunger Games saga closing on a over extended dour note, we didn't know where the futuristic adventures of this teenage boy might be headed. 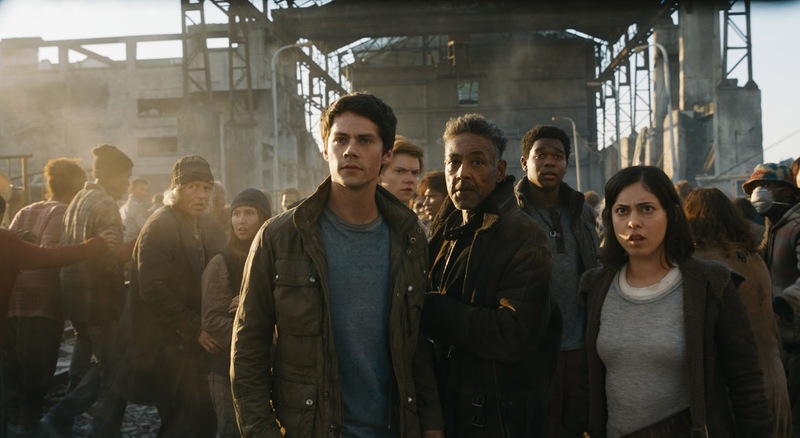 Now, this weekend finally sees the long awaited release of The Death Cure, the final in the Maze Runner trilogy which was delayed by the main star's physical injury on set. Strangely enough, we're thinking that that time off may have given them the leeway to make this concluding entry a much better movie than the last. Using a much tighter script, some gripping action sequences, and tons of character development, Death tastes much sweeter this time around. It's obvious that the writing staff worked out the kinks in order to make this work as well as it does. Where The Scorch Trials failed to capture the glory of The Maze Runner and literally felt like a middle movie, this latest chapter is a bit long but ultimately has great gun play elements, amazing visuals and rudiments based in a story about friendship. The interplay between characters doesn't feel forced at all this time, giving the main players more room to flesh out the concluding moments of their assigned personas. Giancarlo Esposito steals scenes like usual. Walton Goggins eases into a role as a mutated rebellion leader. And Aidan Gillen (and all his accent slipping) returns as the blood thirsty Janson, chewing up dialogue like its going out of style. He is the embodiment of greed and evil. As an added bonus, we get Patricia Clarkson, Rosa Salazar, and Kaya Scodelario balancing out the female realm of the film. Holy crap! A food court?! I haven't seen one of those in years! Main star Dylan O'Brien finally seems extremely comfortable playing Thomas, even as he knows this will be his last adventure in a futuristic world ravaged by disease. Unlike the final installment of The Hunger Games, this doesn't beat around the bush. It gets to the action and stays with the action consistently Again, it's definitely too long. It required twenty minutes cut from the film overall. From front to back, The Death Cure is saturated in massive set pieces, combat shots, and some unexpected twists and turns. Having never read these books, I thought this was probably the best of the series. Shockingly enough, The Death Cure is probably my favorite movie of the post Christmas dumping ground. Set against a bunch of low budget, non-competitive trash over the next couple weeks, this will probably do great at the box office. With nothing to tower over it like Star Wars or Jumanji, Thomas and his band of teenage freedom fighters will have plenty to look forward to. If you're looking to be entertained without having to think and you want to see a bunch of PG-13 non-gore death sequences, check this one out. It's a fair entry in a genre that's had a tough couple years.